Associate professor Morten Nielsen is a Danish anthropologist currently in the Department of Culture and Society at Aarhus University. Based on empirical research carried out in Latin America, sub-Saharan Africa and the UK, his research focuses on land use, house-building and property rights in both urban and rural areas. 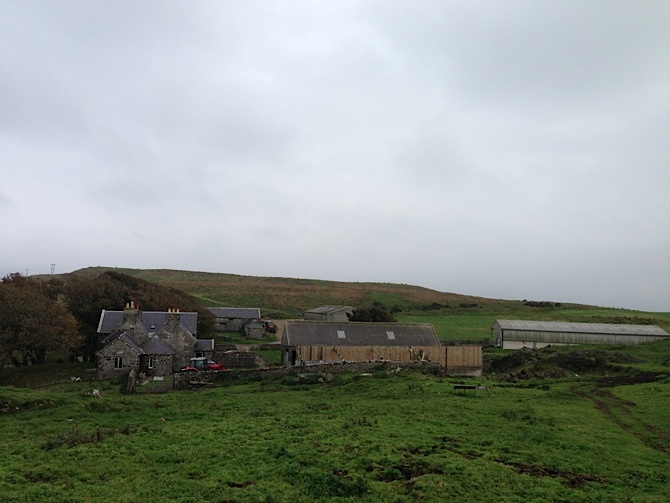 He is currently undertaking an in-depth study of land relations and property rights among tenant farmers on Islay. I had just come off the Islay ferry and was heading for Inveraray when my phone rang and an energetic woman, who was apparently the living embodiment of the Scottish Government, wanted to know if she was, in fact, speaking with me. I immediately assumed that I had done something wrong. Having spent more than two months doing ethnographic fieldwork among tenant farmers on Islay, my initial thought was that I had probably forgotten to fill out some research permit and now my increasing absent-mindedness had finally backfired. Much to my surprise, however, the polite state official was not at all trying to expose my academic flaws but, rather, wanted to discuss my on-going research about agricultural tenancies and property rights on Islay. In order to realise comprehensive land reforms in Scotland, she told me, information was badly needed and my research could potentially provide insights into the intricacies of negotiating land rights in the Highlands and Islands. Having an overall interest in the dissemination of qualitative research, I immediately agreed to meet with the polite embodiment of the Scottish Government. As we could not find an available date for us to meet up on Islay, the state official agreed to visit me in Crail, Fife a few weeks later, on a Saturday, when I was visiting some friends on my way back to Denmark. To Scottish readers, this vignette might not constitute anything out of the ordinary: a foreign researcher being approached by a state official interested in discussing key findings on issues that are high on the political agenda. However, having carried out research on land and property rights in Latin America and sub-Saharan Africa since 2000, I can firmly say that this is the first time ever that I have been contacted personally by a state official interested in the findings from a very short empirical investigation and, moreover, one who was prepared to meet up on a day off. In both regions where I have previously worked, access to officials at different levels has been paramount to my research but the initiative for making contact has always been mine. The obvious question to ask was therefore why did she feel the urge to contact me apparently out of the blue? In order to respond to this question, we need to discard the tempting but unfortunately unlikely possibility that she was in awe of my research findings. At the time of our telephone conversation I had carried out fieldwork for less than two months and had as yet published nothing in academic journals or in more accessible public media. The likely response to the puzzling question is therefore quite banal. It wasn’t that I was the best of all the scientists doing research ‘on the ground’; rather, I was the only researcher doing research ‘on the ground’! In Latin America and sub-Saharan Africa, research into property rights and access to agricultural land is heavily supported and funded by external stakeholders, such as, for example, the UK Government. Hence, whenever I do ethnographic research in sub-Saharan Africa, I am certain to meet several of my colleagues doing research on exactly the same issues as myself. In Scotland, however, the situation is markedly different. Since I started doing research, I have come across very few colleagues doing what I do (which is to try to understand what people do ‘on the ground’ when, for example, farmers attempt to acquire secure access to tenanted land). To be more precise, I have met none! “…too often communities are left guessing who owns the land that they live, work and socialise in”. Taking SAC’s insights as an apt example of an overall problem then, given the lack of information, stakeholders involved in the ongoing process of trying to improve the existing legislation on land and property rights are often in the dark about what happens ‘on the ground’. The need for pragmatic and immediate forms of arbitration. Currently, the only workable mechanism for arbitration is the land court. To many farmers, it is too costly and it is considered as unlikely to reach a viable and positive outcome. Hence, a kind of ‘middle ground’ is needed. The need for third parties when negotiating rent reviews. The recurrent rent reviews constitute critical and often decisive moments that significantly affect or even condition the relationship between landowners (through factors) and tenants. To many farmers, the need for maintaining a workable relationship with the factor will often prevent them from claiming legitimate rights. The need for transparency when calculating the value of tenanted land. My research indicates that there are no objective standards by which landowners determine the value of tenanted land (e.g. an acre of arable land might vary between different comparable farms). This is only a very cursory and superficial outline of a few of the many issues that I have discussed with farmers on Islay. Still, as is probably clear by now, I will claim that it is only through detailed examinations of happens ‘on the ground’ that such crucial insights might be identified and subsequently serve as a basis for establishing new mechanisms for a more just system of land distribution. Let me conclude with an example of what such valuable insights might be used for. During the 1990s, the Mozambican government in collaboration with donors and local and international interest groups managed to involve huge sections of the Mozambican population in widespread debates on the need for a new and democratic land law. Through massive investments, large-scale research projects and ongoing public debates, a new Land Law was finally formulated that was (and still is) the most progressive piece of legislation on land and property rights in sub-Saharan Africa. (3) Today, it is widely acknowledged by all stakeholders involved in the process that the radical and positive achievements could never have been reached if it had not been for the continuous production of information about how Mozambican land was actually appropriated, negotiated and distributed. In this light, the debate on land and property rights in Scotland is that of a developing third world country that can one day hope to reach the progressive level of developed countries, such as Mozambique. (3) For a very interesting read, I highly recommend Chris Tanner’s analysis of the process leading up to the approval of the 1997 Land Law. “A developing third world nation” just about sums our land situation up in scotland. 0.025 of the population owning land over 1 acre is certainly third world. Depressing to see that we’re back in the sterile terriltory of bandying around statistics again but what is the equivalent % in, say, Germany or France? More to the point, what is the % of peeople in Scotland who own *less* than an acre and what % *need* to own more than an acre? our situation is a SUD—-sheer utter disgrace. Good idea. Maybe s/he would know what is the % of people in Scotland who own *less* than an acre and what % *need* to own more than an acre? less than acre is irrelevant as that is house plots. over an acre is the figure that counts, and we are thirteen times less than ireland. As well as needing comprehensive land registration including the names and addresses of beneficial owners “(with a rising scale of civil penalties for non-registration and a freeze on any transfers of beneficial land ownership in the interim) we need locally based land tribunals to offer prompt resolution of disputes anent rent reviews. well lets hope communities in Scotland can rid themselves of the ‘third world land and property rights’ and reach levels of fairness which Mozambique enjoy. As for the three bullet points above, yes they are cursory and superficial in terms of land reform. The landed elite which maintain our third world status would love land reform to be restricted to this area. Look forward to reading professor Morten Nielsen’s other findings! As for my part of rural Scotland which is controlled and owned by one man, i would describe it as being well on its way to becoming a run down backwater. I hope any SNP politician in office who is reading this or has read it, is hanging his/her head in shame—-if they have any. I would especially like to hear the views of Roseanna Cunningham, Rob Gibson and Michael Russell.